It will be another fast year in Pennsylvania in the girls' 400 meters. A trio of girls return from last indoor season having run times under 57 seconds. Leading the pack is Mykala Perry of Neumann Goretti. The junior went 55.65 last season and took second at indoor states to her now-graduated teammate Sydni Townsend. Perry followed up her impressive winter season by winning the AA state title in the event too. She ran an open best of 54.94, and should be in line for another big year on the track. Two others come in with sub-57 times from last season. Saucon Valley's Talitha Diggs was fourth at indoor states last year, running her season best 56.41. She went 54.95 outdoors in her specialty event to take state runner-up honors in AAA. Diggs, also a junior, will be one to watch this season. 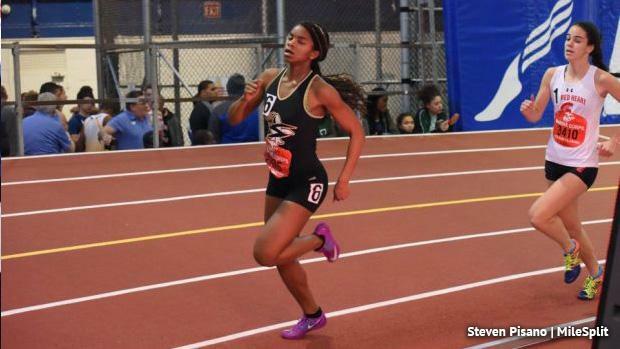 Bria Barnes of Cheltenham went 56.28 last year and will look to close out her indoor career on a high note. The Iowa State recruit was the victim of an unfortunate injury at the indoor state meet last year. Now healthy, Barnes will certainly be a factor. The only other returning medalist from states last year is North Penn's Natalie Kwortnik. The versatile senior went 57.57 to take fifth at indoor states last year. She followed that up with a fifth place finish at outdoor states in AAA and ran a best of 56.63. There's no shortage of depth in the 400 meters in PA, though. Coatesville's Porsha Miles, Neumann Goretti's Dasia Wilson, Chester's Kamani Johns, Penn Wood's Elicia Moore, and Mount Lebanon's Molly Mangan all ran sub-59 times last season. Moore took eighth at outdoor states in AAA in the 400. Coatesville's Arianna Eberly and Warwick's Leah Graybill posted quick outdoor times last year that should translate well to indoors this winter. It's also worth noting that Neumann Goretti has 3 of the top 11 returners from last winter in the event. After No. 1 Perry and No. 6 Wilson, Acey Pratt, a Baldwin School transfer, makes NG a force once again. Look for another special season out of the Saints in the 4x400-meter relay this indoor campaign.